Suggestions (1930) and Prismes - 40 Planches de Dessins et Coloris Nouveaux (1931). E A Seguy produced eleven albums of illustrations and patterns of which Papillons and Insectes were dedicated to insect subjects. E.A. 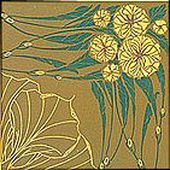 Seguy was a masterful decorative artist who spanned the art eras of Art Nouveau through Art Deco. Seguy produced realistic and decorative assemblages of butterflies and other insects to promote the application of nature into the decorative arts. Although his compositions were design oriented, he made the depiction's scientifically accurate. His later works showed an increased interest in geometric and cubist designs. manufactured by Bianchini Ferier, Lyon, France. Papillon By E A Seguy, Editions Duchartre et Van Buggenhoudt, 1924 : 20 pochoir prints illustrating designs based on the pattern of butterflies. Seguy intended to inspire decorative designers and glorify the sublime beauty of nature.